Congratulations to 2021 P/UT Jen Kuhn on her perfect game this week. Also a big shoutout to 2021 SS on getting press after collecting a couple hits. Both girls play for our 02 Texas Glory Illinois squad. Congratulations to the 04 Texas Glory IL on winning the 16u division of the JK Dingers and Dinkers tournament last weekend. Texas Glory - HTX Wishes Shaelyn Sanders Happy Birthday! Sending our Shaelyn Sanders much love and birthday wishes from your Texas Glory-HTX Teammates! Happy Birthday Shae Shae!! Texas Glory - HTX Wishes Brooklyn Atkins Happy Birthday! Help us welcome Brooklyn Atkins to Texas Glory-HTX and wish her a Happy Birthday! Hannah Cain (18u RWB) signs her NLI to Wellesley where she will continue her academic and softball career. Texas Glory - HTX Wishes Mackenzie Lakey Happy Birthday! Sending our Mackenzie Lakey much love and birthday wishes from your Texas Glory-HTX Teammates! Happy Birthday Big Mack!! Texas Glory Veteran Jayda Comes Out To Cheer On Texas Glory Rookies!! Texas Glory Veteran Jayda Comes Out To Cheer On Texas Glory Rookies! Happy to be part of something that encourages older ball players to come out to the younger athletes games! It makes their day!! Thanks for joining them in the dugout and leading some chants Jayda!! 02 Texas Glory IL MI Kacie Quick (Uncommitted) has a huge day at the plate leading Normal West to an opening day victory. Congratulations to Brianna and her DI team for finishing 4th in their State Competition. This means they move on to Global Finals in Kansas City, Mo. Candain Callahan (19' UNT) nice work! Promoting the game of fast-pitch softball. Creating an environment in which players can reach their full potential and achieve the self-confidence and positive self-esteem necessary to be successful both on and off the field. Developing individual skills and team tactics to enable players and/or teams to compete at the national level. Assisting all of our players in obtaining College scholarships. 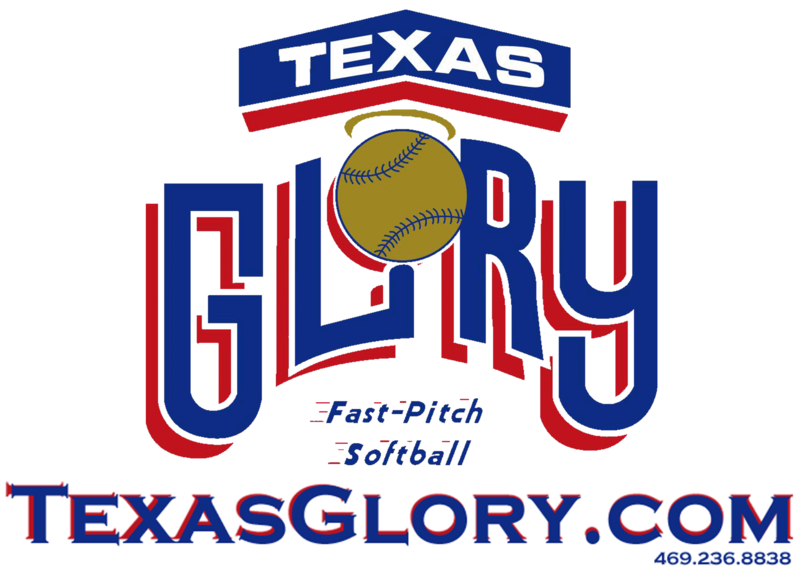 The Texas Glory organization exists for the specific purpose of developing a competitive youth fast-pitch softball program whose goals are to develop players capable of competing at the highest levels in the country with the demonstrated skills necessary to earn a college scholarship. Our dedicated coaches and volunteer staff facilitate our athletes’ growth by conducting challenging practices and scheduling the highest level of competitive activity available. Reaching these goals must be accomplished within the proper framework, instilling character, self-esteem, confidence and sportsmanship. Achievement of these lofty and worthwhile objectives within the appropriate environment can only be reached through the mature behavior and exemplary conduct of the coaches and parents of the Club. Their relationship with the players must be of the highest ethical and moral standards and be based upon concern and just principles that ensure equitable treatment will prevail in all circumstances. An aggressive desire for victory combined with the procedural and graduated development of softball skills through exceptional coaching and advanced training techniques is of paramount importance. Additionally, everyone should realize that fast-pitch softball is only a game and is the forum we use to help our athletes mature into responsible adults.